Javasript is currently disabled. Please enable it for a better experience on this site. 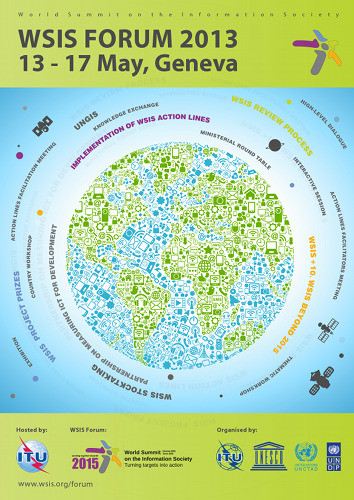 ITU, UNESCO, UNCTAD and UNDP welcome all WSIS Stakeholders to the WSIS Forum 2013. WSIS Forum 2013 will be held from 13 to 17 May 2013 and will provide structured opportunities to network, learn and to participate in multi-stakeholder discussions and consultations on WSIS implementation. This event builds upon the tradition of annual WSIS May meetings, and its new format is the result of open consultations with all WSIS Stakeholders. The WSIS Forum 2013 will be hosted by ITU and will take place at the ITU Headquarters in Geneva, Switzerland. Remote Participation will be an integral component of the Forum details on both onsite and remote participation will be available soon. Onsite participants can network with each other using the imeetyouatWSISForum social networking platform. The World Summit on the Information Society (WSIS) is a unique two-phase United Nations (UN) summit that was initiated in order to create an evolving multi- stakeholder platform aimed at addressing the issues raised by information and communication technologies (ICTs) through a structured and inclusive approach at the national, regional and international levels. The goal of WSIS is to achieve a common vision, desire and commitment to build a people-centric, inclusive and development-oriented Information Society where everyone can create, access, utilize and share information. The UN General Assembly Resolution 56/183 (21 December 2001) endorsed the holding of the World Summit on the Information Society (WSIS) in two phases. The first phase took place in Geneva from 10 to 12 December 2003 and the second phase took place in Tunis, from 16 to 18 November 2005. In 2003, the number of participants was 11,000 representing 175 countries and in 2005 the number of participants was more than 19,000 representing 174 countries. Since then, a cluster of WSIS-related events was held on an annual basis. In 2009, the cluster of WSIS-related events was rebranded as WSIS Forum. The objective of the first phase was to develop and foster a clear statement of political will and take concrete steps to establish the foundations for an Information Society for all, reflecting all the different interests at stake. Nearly 50 Heads of state/government and Vice-Presidents, 82 Ministers, and 26 Vice-Ministers from 175 countries as well as high-level representatives from international organizations, private sector, and civil society attended the Geneva Phase of WSIS and gave political support to the Geneva Declaration of Principles and Geneva Plan of Action that were adopted on 12 December 2003. More than 11,000 participants from 175 countries attended the Summit and related events. The objective of the second phase was to put Geneva's Plan of Action into motion as well as to find solutions and reach agreements in the fields of Internet governance, financing mechanisms, and follow-up and implementation of the Geneva and Tunis documents. Nearly 50 Heads of state/government and Vice-Presidents and 197 Ministers, Vice Ministers and Deputy Ministers from 174 countries as well as high-level representatives from international organizations, private sector, and civil society attended the Tunis Phase of WSIS and gave political support to the Tunis Commitment and Tunis Agenda for the Information Society that were adopted on 18 November 2005. More than 19,000 participants from 174 countries attended the Summit and related events. Building on Para 109 and Para 110 of the Tunis Agenda for the Information Society, WSIS Forum is organized each year, hosted by the ITU and co-organized by ITU, UNESCO, UNCTAD and UNDP. Information on previous forums is available here. The World Summit on the Information Society (WSIS) outcome documents and the UN General Assembly Resolution 60/252 resolved to conduct an Overall Review of the Implementation of the WSIS Outcomes in 2015.